The Toco Toucans (Ramphastos toco) are the largest and most recognized of all toucan species because of the bird's iconic use in advertising. 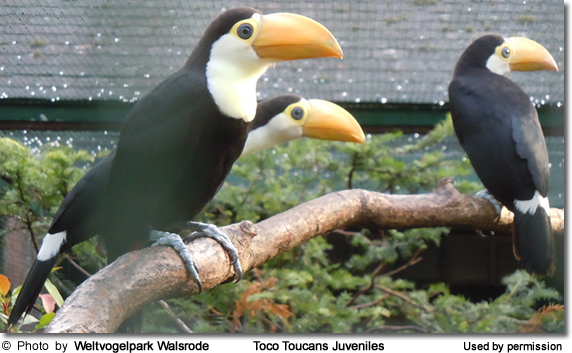 Toco Toucans have the widest distribution of all toucans occurring in central and eastern South America, where they inhabit tropical areas and dry savannahs. Unlike other toucans, they typically don't inhabit forests. They are mostly resident, although local movements may occur in response to weather conditions and availability of food. 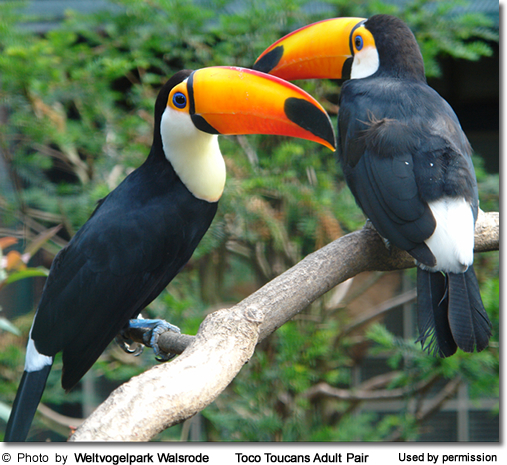 Over most of its range, the Toco Toucan is fairly common and is, therefore, considered to be of Least Concern. eastern and southern Brazil (excluding southern Rio Grande do Sul, the dry regions dominated by Caatinga vegetation and coastal regions between Ceará and Rio de Janeiro). It has a a striking plumage with a mainly black body, a white throat, chest and uppertail-coverts, and red undertail-coverts. It has a ring of blue skin around the eyes that is surrounded by another ring of bare, orange skin. It has a big yellow-orange bill with a black base and large spot on the tip. Immature birds have a duller plumage and a shorter bill. 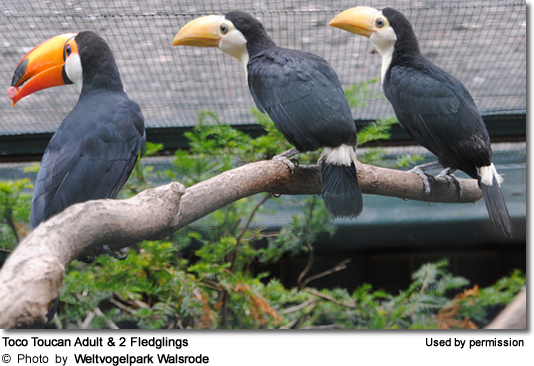 They resemble the smaller Keel-billed Toucans and Chestnut-mandibled Toucans, but these toucans can easily be differentiated by their varying bill patterns and body sizes. Unlike the popular parrots, captive toucans cannot learn to talk. On the bright side, they are also much quieter. Generally, they are friendly and easily tamed. They are fairly long-lived with a lifespan around 20 years. The mating ritual is a fun-loving affair for toucans, as they throw fruit to one another. Like all of their other activities, nesting happens high up in hollow areas in trees. The bill is not effective for digging or any other type of extensive excavation work and so they must rely on holes already formed by other means. The nests are not lined, but the two to four shiny white eggs that are laid each year rest on a few wood chips created while enlarging the opening or on various kinds of regurgitated seeds collected for this purpose. Parents share equally in incubation duties, but rarely sit on the nest for more than an hour at a time and the eggs are often left uncovered. Both parents share in feeding fruit to the babies for up to 8 weeks. After 16 days the nestlings are born blind, with no trace of down on their pink skin. 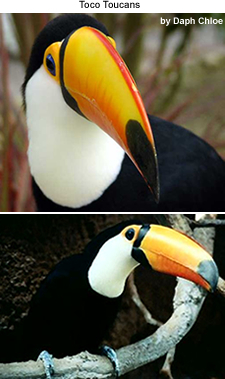 The bill is unremarkable until about 16 days old when it takes on the distinguishing features of the toucan, and requires up to four months to develop fully.Feathers begin to expand at 4 weeks. Babies have pads on their elbows that protect their feet by keeping them elevated until they fledge. Breeding in captivity requires attention to a number of details. Even successful breeders report rates as low as 30% for the incubation of eggs. The Toco Toucans' calls are described as deep, coarse croaking, typically repeated every few seconds. They also make rattling calls.